Because it contains mulberry leaf and nettle herb, which slow down the absorption of carbohydrates from the intestine into the blood, we recommend the product as a daily dietary supplement when you want to keep a healthy body weight. The product has a detoxifying effects thanks to horsetail herb, dandelion herb, and nettle herb, which also supports losing weight. 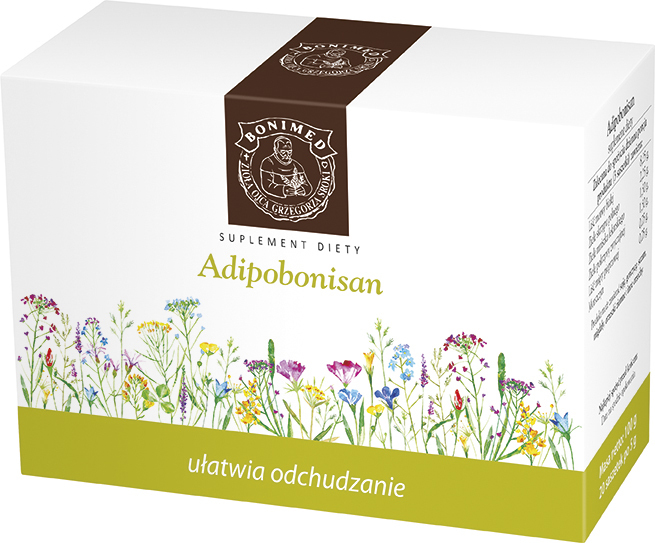 This herbal blend also includes fucus, so it provides iodine to the body, which helps keep a healthy metabolism, a must when you want to lose weight. Recommended daily intake of the product (3 sachets) contains: Mulberry leaf 8.25 g, horsetail herb 2.25 g, dandelion herb 1.5 g, nettle herb 1.5 g, peppermint leaf 0.75 g, fucus 0.75 g.
Contraindications: Taking the product by children is not recommended. If you are pregnant or breastfeeding, don’t use it. Don’t use it if you are allergic to the product ingredients. If you have hyperthyroidism, talk to your doctor before using the product. Recommended intake: Take 1 sachet by mouth 3 times per day before a meal (make an infusion). Dietary supplements should not be treated as a substitute (replacement) of a varied diet. Do not exceed recommended daily intake during the day.